No I don’t have a gun"
So the funeral began and the celebrant started by saying a song would be played. I’d been holding it pretty well together at this stage and had my tissues prepared for the inevitable tears, that is until they started playing this song. I really love the song and now I’ll always remember it as the song that was played at my cousin’s funeral. The tears started flowing a bit more quickly than I’d anticipated and my shoulders started shaking. I don’t know what it is about crying in public – even at funerals – that makes me feel really self-conscious but it does. This is the first time that I didn’t really care. My previous memory of this song, and indeed the whole album by Nirvana – Nevermind was from when I was living in London in 1992 and I had it playing almost non-stop on my Walkman. By the time they played the 2nd song (not sure of the title of that one) I had it pretty much together and had even had a couple of laughs by then. There was a good speaker at the funeral that had a couple of funny stories to tell which is part of what funerals should be about I think. Back to music though. It has a tendency to evoke memories and emotions for me, as I’m sure it does for many people. We quite often listen to music at home and yesterday I put on a CD that begins with Paul Kelly’s From Little Things Big Things Grow and JJ told me it made his heart dance. Typing this makes me smile now as it made me smile when he told me. A lot of music makes my heart dance, including the aforementioned Paul Kelly song. Although when I saw it performed on Rockwiz by Archie Roach and Sara Storer it made me cry. I must have been feeling a bit fragile at the time as it’s not a particularly sad song, but quite poignant I guess. It’s a song about a dispute over wages and conditions between Australian Aboriginal stockworkers and landowners and became a fight for land rights. It was called the Gurindji Strike. I digress though. I bought a CD called KY Jelly by Lemon Jelly a few years ago. I put it on when I’m feeling a bit down as it uplifts me. I can’t really describe what it is about the music that uplifts me, it just does and by the end of the CD I usually feel a lot better. I have other music I put on when I’m doing housework. As I’m mentally preparing for my larger weekly clean I think about what music I need to listen to and select something to listen to while I work. It has to be turned up very loud to go over the noise of the vacuum cleaner. It’s usually something quite upbeat like the Chemical Brothers. I’m sure they’d love to know they’re my housecleaning music. I do enjoy them in other situations also. Songs that are big hits at certain times evoke memories for me of that time. Unfortunately this applies for songs I really hate like Whitney Houston’s I Will Always Love You. When this song came out my work colleague listened to a popular FM radio station and they played this at least three times a day. I never liked it anyway but after hearing it so often I will always hate it with a passion, but I’ll never forget the colleague who’s radio played this song, and where I was working at the time. When other songs come on the radio or on Rage late at night many of them bring a smile to my face because I haven’t heard them for so long and I used to really love them. It could be a song from when I was growing up, or when I started going out to discos and nightclubs. Why do you blog? This is a question I ask myself pretty regularly and I don’t have a definitive answer. For me it’s partly about the sense of community and the other part is that I just like to write. Someone else is also asking this question and you can fill in the short online survey if you wish over here. There are prizes to be won! On Sunday night my household is going to change as there is a new person coming to live here for a while. My 16 year-old nephew is going to school in Adelaide and will be boarding with me. This is partly why I’ve been busy having a garage sale and clearing a heap of stuff out the house – to make room in his room for him. My hallway is still full of crap but by the end of tomorrow night it will be mostly organised. I hope I’m doing the right thing in having my nephew coming to live here. I can see the good points – walking the dog by myself in the morning, other occasional babysitting, another nearly adult to talk to, someone else to take the heat of JJ off me occasionally, just having another body around to help do physical stuff I can’t do by myself. I can also see the negatives – more hormones to deal with, more cooking and cleaning to do although I’ve made it pretty clear I won’t be his slave, not having my privacy as I’ve been used to since I stopped sharehousing. Mum just asked me the other day if I’d bitten off more than I could chew. Perhaps I have but I’m pretty sure the good outweighs the bad and if it’s just too bad for whatever reasons then I’ll have to let his parents know to make other arrangements. I like to think that we can sort things out about him living here without having to involve his parents. I also think it will be good for our long term relationship. And it will be good practise for when JJ is that old, although I might have wiped things from my memory by then – a bit like childbirth. So, overall I’m dubious but feel that it’s the right thing to do. It’s cricket time of year here. There’s no escape from it on Channel 9, and most weekend days and some week days there’s cricket being played on a local oval. JJ and I had a discussion about it and being the encouraging parent I am I told him that it takes a long time to play a game. I’m not real keen on him developing an interest in playing the game purely because I don’t fancy spending half my weekend watching him. He obviously understood that a day is a long time because he told me he didn’t think he’d play cricket because they wouldn’t get time to eat. He loves his food and the thought of not being able to eat whenever he likes obviously worries him. A few days later we were discussing the occupations of bus and train drivers. I told him they’d drive to the end of the bus or train route and turn around and come back. He then informed me that he didn’t think he’d become a bus or train driver because they don’t get time to eat. I tried to explain that both cricketers and drivers do get time to eat but it didn’t sink in. I’m thinking he’ll always do something where he can eat when he likes. Addition – I meant to mention at the end of this post. Despite JJ’s obsession with food his memory lets him down. Yesterday at work I got a phone call from his vacation care director. They were at the pool and JJ had forgotten his lunch after being asked to put it in his bag. He had to miss out on food for various reasons and didn’t get his lunch until mid afternoon. I’m detecting a bit of a theme in regards to JJ sleeping with various toys in various states of action. He obviously starts playing with them and they wear him out so much that he just falls asleep while still playing. Here’s the latest in the series, a shark puppet. 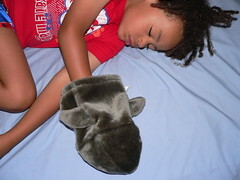 It was a particularly hot night here too which is why he sleeps without any bed coverings. I usually put a sheet over him but that ends up all twisted around him or just completely off. 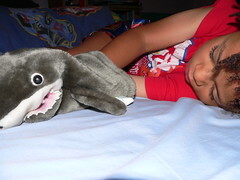 To see other photographic evidence of what he ends up sleeping with, see him with his other shark, sleeping in the batman costume, sleeping with my old doll. I guess I’ll have to stop this practise of taking photos while he’s asleep when he’s a bit older and starts sleeping with real live people. That probably wouldn’t really be acceptable. It’s just occurred to me that this blog is nearly always in a first draft state. Because it’s so easy to write a blog post and then publish it, I don’t think too much, or work too much on most of the posts I write. A post starts with me thinking of of a topic for the post and then thinking of an appropriate title and starting to type. The post might be based around an image, or it might have an image added if I can think of one but usually it’s just an idea and no image is included. I don’t tend to hold onto a blog post while finessing it. Perhaps it shows? Hence the eternal first draft. When I wrote the post about the sudden death of my cousin I started it not than long after I got the news. I had to write it down to make sense of it and it’s something I felt like sharing for some reason. I wanted the post to convey the emotion I felt upon receiving the news. I finished writing it the next day after I’d had time for the news to sink in. So it took a bit longer than my usual blog post to compose. I still don’t know if I did it justice but it’s still really just a first draft. Posting to a blog is perfect for the instant gratification of writing something and having it instaneously published to add to the body of work that is your blog. Ninety percent of the time a blog post for me can be done within half an hour, usually shorter, and this is including the mulling it over in my head before I even start to write. But what about the second and subsequent drafts? Is the blog the place for these? For me it’s not at the moment but it might be something to start thinking about if I ever want to move away from the first draft and work on second and subsequent drafts. Whether I ever do this or not I can’t say at this stage, and whether I will start up ‘Semantically driven – the second draft’, I don’t know, but I have nearly three years of posts here. There might be an idea contained within that’s worth pursuing. I bought myself a bike as I’d earlier promised my son. I dusted off my bike helmet and rode it home from the shop. I haven’t ridden it since but it’s been stinking hot here and we’ve had other things on. I’ve been doing laps every day at the pool while JJ does his swimming lessons. I haven’t swum laps for about three years and I thought I’d have to be rescued by one of the lifesavers as I floundered at the deep end before I could reach the end of the pool. It’s a bit like riding a bike though – the breathing I use for swimming has come back to me without many problems at all. JJ’s swimming abilities have improved no end with his every day attendance at swimming lessons too. And he loves it. I had a garage sale the other day and raised bugger all money. I ended up giving the rest of the stuff away. If it weren’t for a friend of a friend buying quite a few things I would have made a loss. People coming to garage sales want to tell you their life story, buy your stuff for next to nothing, and tell you that this is priced too high as it’s been superseded (my sister’s stuff, not mine). Some people bought some of my old tapes and my music taste was commended – David Bowie, Cold Chisel (Circus Animals) etc. I had a phone call from my younger sister yesterday telling me she’d been asked not to make a scene at my cousin’s funeral. My middle sister was apparently one of a delegation asked to tell my younger sister this. There is no way in hell she would ever make a scene at anyone’s funeral she attends and for anyone to think that absolutely appalls me, and obviously there’s more to this story than I’m recounting here. Suffice to say that families are full of a hell of a lot more politics than I’ve ever enountered at work. My middle sister likes to stir the pot and has also apparently been bitching about me to one of my friends she’s been shagging. We’ve had issues recently which I had a chat to her about but after the funeral next week I need to have another talk to her to see what issues she’s obviously got with me. All the stuff that’s been happening – particularly the last one – has been churning around in my mind and seeking an outlet. I’ve found part of that outlet but it’s not appropriate to drag the whole story out here. It’s been really great doing the laps at the pool because when I’m there doing my swimming, I just concentrate on that and all else leaves me. I’ve also been using the rest of my time after swimming to catch up with friends while I’m on holidays.